Welcome to Harpist from the Heart. A professional harp player, Harpist Annette Wiles provides beautiful music for all events and special occasions throughout Southern California. The harp is a symbol of timeless elegance and refinement. The harp’s graceful beauty, warm tone and delicate sound combine to create the perfect ambience for any occasion. 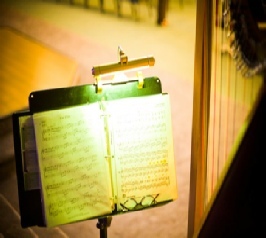 Beautiful harp music is the perfect complement to any event. The harp’s elegance and gentle, soothing tones make it perfect for background music that allows for easy conversation during your special event. Contact Annette at (951) 235-3746 to schedule a complimentary consultation or click here to view Annette’s repertoire and listen to some audio samples. Annette has played at restaurants, weddings, winery events, baby & bridal showers, holiday parties, church services, fundraisers, memorial and funeral services and at nursing homes.